Wigan Athletic’s third match in the Europa League will be at home to Rubin Kazan on October 24th. The return match is scheduled for November 7th . Rubin are currently in 7th place in the Russian Premier League, but are unbeaten. They have won two and drawn five matches, conceding only three goals. Last season Rubin finished 6th, becoming one of four Russian teams qualifying for the Europa League. Rubin performed well in the Europa League last year, winning their group, being unbeaten in the six matches. In doing so they beat Inter Milan 3-0 at home after drawing 2-2 at the San Siro. They stunned holders Atletico Madrid in the last 32 with a 2-0 win at the Vicente Calderon Stadium after losing 1-0 in the home leg. Then followed a 2-0 home victory in extra time over another Spanish team, Levante, after drawing 0-0 in the first leg. The quarter final first leg at Stamford Bridge saw Chelsea beat them 3-1. Rubin fought hard in the return match played in Moscow but a valiant 3-2 win was not enough and saw them eliminated. 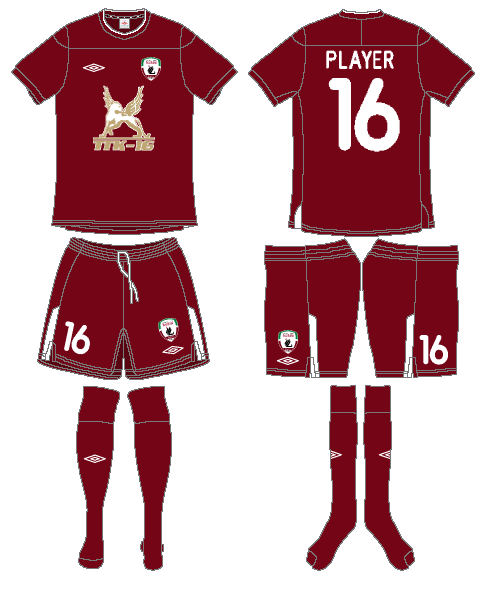 Rubin Kazan was founded in 1958 under the name of Iskra. The club never played in the old Soviet Top League and languished in the lower regional leagues until they won promotion to the Russian First Division (the second tier) in 1992. They won the First Division eleven years later, being promoted to the Russian Premier League for the first time in 2003. Since then they have performed well, winning the championship in 2008 and 2009 and the Russian Cup in 2011-12. They took four points off Barcelona in the group stage of the Champions League in 2009-10, including a 2-1 win at the Nou Camp. Rubin – which means ruby – are based in Kazan, a city of over 1 million people in the Republic of Tatarstan. Kazan is around 460 miles south east of Moscow. It is the eastern-most city with a team competing in this year’s Europa League group stage. Average daily high temperatures drop from 8º C in October to -1º C in November. 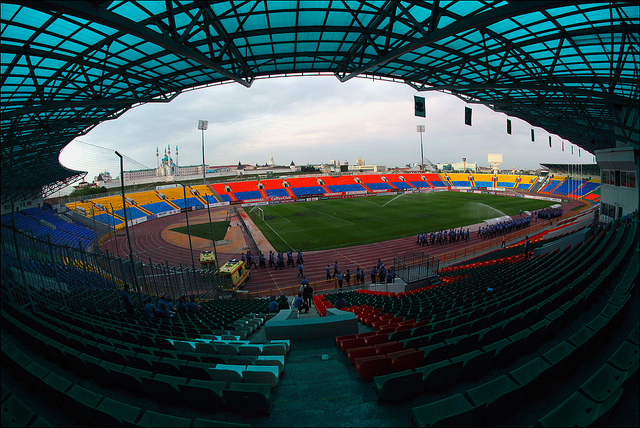 Rubin currently play at the Central Stadium, which is municipally owned, accommodating 30,133 spectators . They are shortly due to move the new Kazan Arena – capacity 45,105 – which will host the 2018 World Cup. Rubin’s home kit is ruby red. Around one half of their senior squad are Russians, the remainder foreign players from diverse backgrounds. In order to reach the group stage of this season’s Europa League, Rubin had to go through three qualifying round. They not only knocked out Jagodina (Serbia), Randers (Denmark) and Molde (Norway), but won all six ties they played. Rubin have substantial experience over the past ten years in both the Champions League and the Europa League, gaining notable results. They have a tight defence and a dangerous forward in the Venezuelan Salomón Rondón – signed in summer 2012 from Malaga for €10 million – who scored three goals in the games against Inter Milan last year. Before the draw for the group stage was made Latics were hoping to avoid a trip to Russia. They are going to have to come to terms with the length of the journey and the visit to Tatarstan will be at the onset of winter, when low temperatures are a strong possibility.More than that they are going to meet a side that is going to be difficult to beat. Group D of the Europa League – with Wigan, Zulte Waregem, NK Maribor and Rubin Kazan – might not have the glamour clubs of some of the other groups. However, it is going to be very competitive with any one of the four teams having a decent chance of progressing to the next round. There are going to be no easy games.The top two teams in each of the 12 groups, together with 8 third placed teams from the Champions League, will compete in the Round of 32 which starts in February. The Europa League is a big competition. Last year 193 clubs from 53 countries were involved. In order to reach the final from the group stage Wigan would need to play 14 matches. When Fulham got there in 2009-10 season from the qualifying rounds they had to play 19 extra games. However, there are significant financial rewards for progressing through the various stages of the competition. It will be interesting to see how Owen Coyle approaches the Europa League matches, where the football is going to be a different style than in the fast and furious Championship. He has some players who have already played in the competition for their previous clubs, but for the majority of his squad it will be a learning experience.